NEW YORK - Robert Pattinson was nearing the end of shooting the last “Twilight” film, concluding a chapter of his life that had picked him out of near obscurity and was preparing to spit him out … where exactly? “Twilight” had made him extravagantly famous, but his next steps were entirely uncertain. “Out of the blue,” he says, came the script for “Cosmopolis” from David Cronenberg, the revered Canadian director of psychological thrillers (“Videodrome,” “Eastern Promises”) that often pursue the spirit through the body. Pattinson, having never met or spoken to Cronenberg, did a little research: He looked him up on Rotten Tomatoes “and it was like 98 percent approval,” he says. “It was like: OK, that’s my next job,” says Pattinson. Pattinson now has the unenviable task of releasing his most ambitious movie, his most adult role, into a media storm that instinct would suggest should be run from like a pack of werewolves. Promoting “Cosmopolis” puts Pattinson in front of cameras and microphones for the first time since his “Twilight” co-star and girlfriend Kristen Stewart last month publicly apologized for having a tryst with director Rupert Sanders. If Pattinson is understandably guarded about his private life, he’s refreshingly openhearted and humble about his anxieties as a young actor. At 26, Pattinson may be one of the most famous faces on the planet, but he’s still getting his bearings as an actor _ a profession, he says, he never pined for, fell into by chance and has always found uncomfortable. His unlikely trajectory began with “Harry Potter and the Goblet of Fire” and “Little Ashes,” in which he played Salvador Dali. “Cosmopolis” is a radically different kind of film that will surely confuse not only the hordes of diehard “Twilight” fans who will line up on Friday to see it, but art house moviegoers, too. Pattinson himself has watched it four times to try to get his head around it. The first movie adaptation of a Don DeLillo novel, “Cosmopolis” is about a sleek financier, Eric Parker (Pattinson), slowly making his way in the airless sanctuary of his white stretch limo across a traffic-jammed Manhattan with the simple goal of a haircut. But the journey, which includes visits with his new wife (Sarah Gadon), a prostitute (Juliette Binoche) and Occupy-like protesters (Mathieu Amalric), is a kind of willful unraveling for Parker, who dispassionately watches his fortune slide away on a bad bet on the Chinese yuan. Pattinson is in every scene of the film, which relies on his callow, hyper-literate performance to carry the movie through its limited setting and DeLillo’s heightened dialogue _ much of which Cronenberg transcribed verbatim from the novel. Though some reviews have found the film static and impenetrable (perhaps intended responses), most critics have praised Pattinson’s performance, with many citing it as proof that the heartthrob can indeed act. 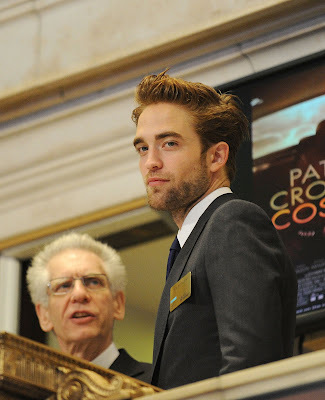 he stylized language and atypical nature of the film made it a risky and intimidating choice for Pattinson. “Rob, he’s popular,” says Cronenberg with deadpan understatement. Pattinson seems energized by the freedom of choice in front of him following the final “Twilight” installment, which will be released in November. He’s lined up parts in gritty films far from blockbuster size: “Mission: Black List,” a military thriller, and “The Rover” by Australian director David Michod (“Animal Kingdom”), a role he says he fought for more than any before. “As soon as you start existing in a certain world, you feel like you have tremendous amount of baggage all the time,” he says. “You get stuck in this rut where you want people to think you’re something else, but you’re too scared to do what that is to actually be the other person.